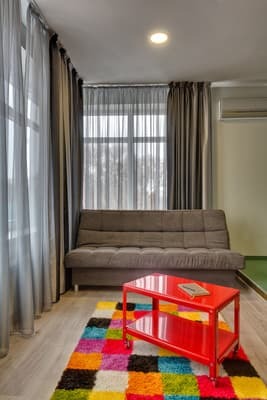 The hotel "Emigrand art hotel & restobar" is located in Uzhhorod, 2.3 km from the railway station. The hotel consists of 24 double rooms. 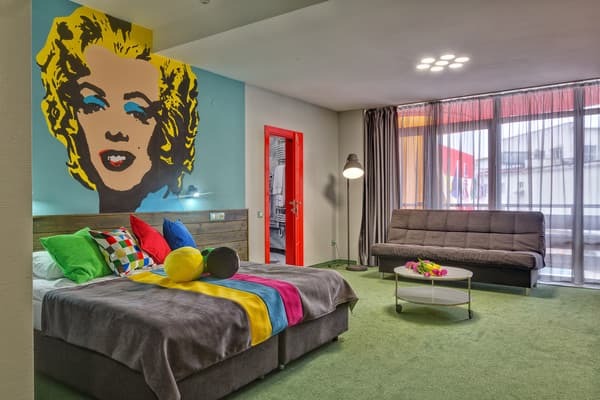 The interior of the hotel is made in the style of pop art with the use of bright colors, a combination of different textures and images of comics on the wall. 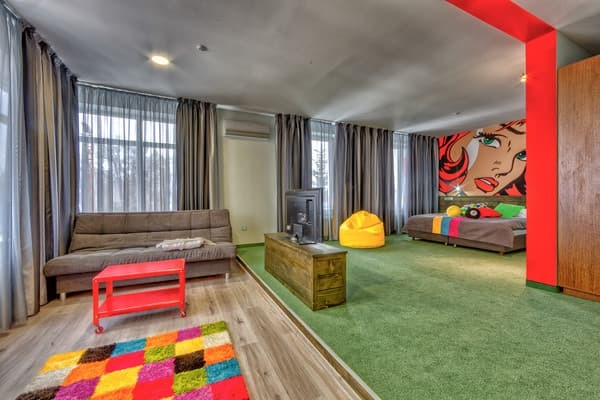 Each room has a double bed or two twin beds, flat screen TV with satellite channels, air conditioning, own bathroom, individual picture on the wall. 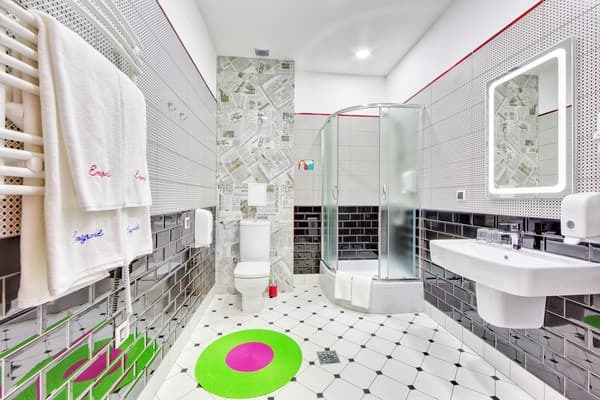 A bathroom in the rooms with a shower. Free Wi-Fi is available throughout the hotel. 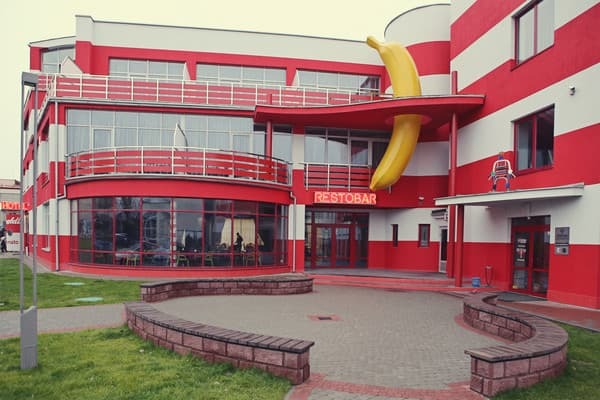 Residents can eat at the restaurant "Emigrand restobar". The menu combines dishes of 4 cuisines - Italian, Ukrainian, Jewish traditional and American. Breakfast is available at an additional cost. Emigrand art hotel & restobar is 2.1 km from the bus station. Новый, очень стильный отель. Всё сделано качественно, номер очень просторный. Завтраки вкусные как и другая еда в ресторане. Чудовий готель. Дуже стильний. Гарне обслуговування. Чисто і затишно. Очень понравилось. Стильно, чисто, тихо, прекрасный завтрак. В следующий раз только там. Цена - качество идеально. Нет минусов. Только положительные эмоции. Вдале розсташування готелю - буквально декілька хвилин пішки до липової алеї вздовж набережної, що відповідно дуже зручно для прогулянок в центр і по обидва береги річки. Готель недавно збудований, номери просторі, яскраво оформлені і з новими меблями, є фен у ванній. На прохання також можна взяти електорочайник і праску. Персонал привітний) Сніданки можна вибрати заделегідь із 4 видів. Рекомендую однозначно! Children under 6 years can be accommodated for free without providing a separate seat. Extra bed on request (paid service). Residents can eat at the restaurant "Emigrand restobar". The menu combines dishes of 4 cuisines - Italian, Ukrainian, Jewish traditional and American. Breakfast is available at an additional cost. The hotel "Emigrand art hotel & restobar" is located in Uzhhorod, 2.3 km from the railway station. Emigrand art hotel & restobar is 2.1 km from the bus station. The hotel "Emigrand art hotel & restobar" can be reached by taxi.